Custom Quilt Labels. Made to order. - Custom embroidery of your message on the label. Your choice of script or block font and a choice of thread color for your text. A minimum of three lines. I recommend block font for most labels. A quilt label is an important part of your finished quilt. Documenting the history as to when the quilt was made, by whom, as well as whom it was gifted to will ensure the quilts history will be remembered from one generation to the next. Your custom embroidered quilt label will last the life of your treasured quilt. Quilts labels are also perfect for other quilted and/or handmade gifts such as tote bags, book journals and more. 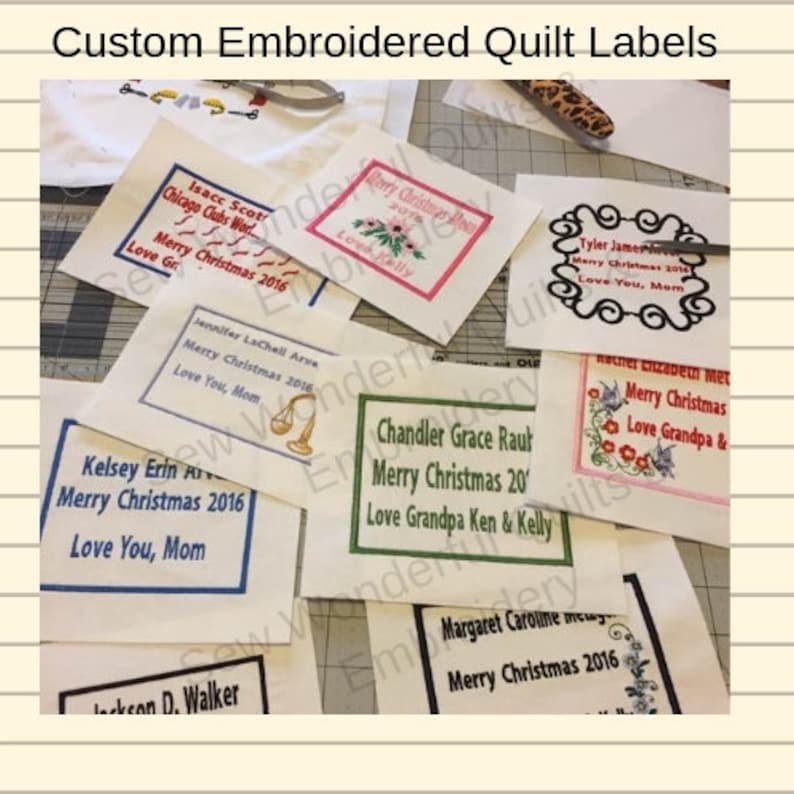 ***All quilt labels are made to order. At the time of purchase please include your personalized message, your choice of font, and thread color. Prior to completing your order, you will receive a convo with a sample image of your order for approval. I use a professional embroidery machine for all embroidery orders. To help prevent puckering, I use the appropriate stabilizer in all embroidery items. The thread colors used to stitch the design may vary slightly from the photo shown in the listing. The label is trimmed allowing 1" for needle turn applique to your quilt. Orders are processed within 48 - 72 hours of purchase and shipped within the next business day. Disclaimer: Image(s) are owned by Sew Wonderful Quilts & Embroidery. I am selling the embroidered finished product not the design files. Thank you. This is the perfect label for the quilt! Payment is due at the time of purchase. I accept PayPal. Because most of my merchandise is Made-to-order, most sale items are final. If there is an error with your order, such as wrong item, or color received, or incorrect monogram lettering or spelling, please contact me within 5 working days of receipt to request a refund. Prior to receiving a refund, your purchased items must be returned to Sew Wonderful Quilts & Embroidery in the same condition as received. Refunds do not include shipping costs. Shipping costs is provided with each listing, which includes the current postage rate and packaging cost. Insurance and other shipping/delivery request are extra, at the buyers expense. Depending on the item size and the quantities purchased, I ship your purchases by US First Class Mail, USPS Priority Mail, or USPS Parcel Post. Please see shipping details posted with each listed item. A tracking number is provided for Parcel Post and Priority Mail packages. Unless requested, tracking numbers may not be available for Small First Class Mail orders. Unless otherwise noted within the listing, your purchase is shipped within 1-2 weeks after the date purchase. I am not responsible for purchases lost or damaged during delivery transit. Shipping insurance is available at buyers’ expense. Indicate prior to making your purchase if you wish to purchase shipping insurance. Frequently asked questions, but feel free to contact me with any questions. Do you offer custom-made orders? Yes. Most of my items are custom “Made-to-Order” items. Many of the items I offer are seasonal, personalized gifts, special event items and home décor’. Not at this time. Custom-made items are made and shipped in the order they are received. For rush orders, please visit my shop for pre-made, ready-to-ship items. What if I ordered the wrong monogram lettering or color? Most orders are personalized for each customer. In most cases, sales are final for Made-to-order purchases. I want all Katiebug customers to have a good experience shopping in my store; so please contact me if you need help with your delivered purchase. To ensure your order is personalized correctly, please carefully review your order before you make your final purchase. Will you ship international addresses? No. Currently, I ship within the United States only. Disclaimer Copyright Information: I have permission to used/sell the "finished" embroidery designs in the products I listed in my store. Some image(s) provided by Embroidery Library, Inc.